Studio Time And Quilt-Cam Announcement! I’ve literally hit the floor in a scramble to get moving this morning. I’ve got a BRUNCH date with my friend Jen in an HOUR! All I’ve managed to do so far today is get a shower, and then found myself re-doing a class supply list for an upcoming workshop that kept coming up as a broken link and I couldn’t figure out what the deal was. And I looked at the clock – my morning time has been swallowed up and I need to head out the door! Egad! I guess the other finds from my Blue Ridge Mountains drive along will have to wait for another day. I do have to thank Gayle for the beautiful bundle of shirt plaids that arrived yesterday. I am so excited to sew these up into Sugar Bowl blocks that I think we need to throw in a Quilt-Cam tonight, don’t you? Meet me in Facebook Live at 8pm Eastern, and we’ll do a bit of stitching together. Quipped by Bonnie K. Hunter at 9:40 AM 9 Snips & Comments by others! Did you ever see a street sign that just piqued your interest? Where does it lead? What hidden treasures can be found just by taking it? This time I didn’t pass by. I bravely turned my van Moby and rumbled across a fairly narrow concrete bridge, and made a left hand turn onto a gravel road that seemed to run along the river. It was the best choice I could have made that day. Sometimes we can be swallowed up by routines and to-do lists that drown out the possibility of discovery. I gave up the deadlines for discovery and I’m so glad I did! Quipped by Bonnie K. Hunter at 11:04 AM 36 Snips & Comments by others! There is no time like the present to get these little gems up here on the blog – the response in two days has been overwhelming, and I am listening! This is a BLOCK TUTORIAL. Instructions for a full quilt may come later, but it will take me a long time to build the number of blocks I need, and I’m trying to get this out here before I fly off to Oregon on Monday. If you read yesterday’s post you will recall that the Sugar Bowl block is related to the Jacob’s Ladder block, with a few slight differences. Jacob’s ladder has 5 4-patches, with the dark chain of the 4 patches going UP through the ladder formed by the 4 half-square triangle units. In the Sugar Bowl block, 2 of those corner 4-patches are replaced with solid squares, the light half of the triangle units point toward the center (opposite of Jacob’s Ladder) and the darks in the 4-patches go side ways across the block, not up the ladder. It’s a subtle difference obtained with fabric value, and rotation of units, and it makes for an interesting change. Quipped by Bonnie K. Hunter at 11:43 AM 40 Snips & Comments by others! Summer is so very quickly making a shift, a transition, and beautifully heading into autumn. I can feel it in the mornings when I step outside to take Sadie for her morning business walk. The dew on the grass is just a bit chilly. The leaves in the trees are acquiring a faint hue of yellow. I can only imagine how beautiful it will be up here – my first fall in the mountains of southwest Virginia where the altitude is just a bit higher, and trees are plentiful. It won’t be long until fireplaces are blazing – hot chocolate and warmer “stick-to-your-ribs” kinds of meals are on the horizon. Quipped by Bonnie K. Hunter at 10:40 AM 120 Snips & Comments by others! Sundays are for Sleeping, Sewing, Soup & Silence. This was my view this morning as I awoke. A much needed lazy kind of awakening. I remembered to turn OFF the dinger that lets us know that wildlife could be in the yard. I didn’t want to think about bears. I didn’t want to think about any number of things that are going on in my world at the present moment. And I realized, that no matter how quiet I might be on the outside, I can’t stop the noise inside my head and my heart from screaming right now. I am feeling so sad for friends in the path of Hurricane Harvey who have lost everything. It got to the point where I had to turn that news off and try to find a quiet spot for my mind to rest. If you or your loved ones are affected by this storm, I am so sorry. You have my thoughts and my prayers. And I feel like that isn’t enough. It isn’t enough. That could be any of us dealing with that mess right now. In my head I hear the words of the long ago margarine commercial from my childhood. “You can’t fool Mother Nature!” More like, you can’t mess with Mother Nature. Things can change a life so quickly. Quipped by Bonnie K. Hunter at 10:22 AM 337 Snips & Comments by others! Last Stitches, Quilts, and Bears–Oh, My! I arrived back at Quilt Villa late last afternoon with one agenda on my mind for the evening. I was bound and DETERMINED to finish the hand quilting on my 10 year UFO project, which really doesn’t have a name. I figured that by the time I had finished it something would have come to mind, but after 10 years? However, I love this quilt for so many reasons. The quilt was made from blocks that are much older than 7 years - it was a way to clear out a bin of orphans that had been growing for a long long time. And I only had a space about 14’’ x 6’’ to fill with Baptist fans….the end was in sight! And as I write this I realize that I should go through this process AGAIN. The bin is once again full of pieces and parts. Quipped by Bonnie K. Hunter at 10:58 AM 49 Snips & Comments by others! Desk Days & Half Ways. This was my view around 10pm last night. After spending all day at my desk (The TV also doubles as my monitor – I like it big for designing) I looked up and saw that it was after 9pm. Already. I do have a known condition jokingly referred to as “hyperfocusitis” which technically means that when I am in the zone, all else is tuned out. This means, if I am in the middle of something, whomever wants to talk to me needs to fully pull my attention away from whatever I am doing to make sure that my ears are hearing and my brain is comprehending what they are saying. Or I won’t hear a thing. It has its benefits! I can power through something head on and tackle deadlines knocking them out left and right. But it also makes me forgetful of other things. Quipped by Bonnie K. Hunter at 9:01 AM 27 Snips & Comments by others! Remember this fun excursion to Mary Jo's last February? Cheri (center) and Joyce (right) drove ALL THE WAY from Minnesota playing Pony Express to bring me a special machine and library table that Cheri had found. Many circumstances came together to let me know that this machine was destined for me, and I so appreciate both of these ladies for the sweethearts they are. You can re-read the story HERE. Joyce has been on one of my cruises, and Cheri even came out to Montana to take some workshops – I would be a happy girl if they both lived next door to me! So imagine my happy response when both of them showed up to my Chaska, Minneosta workshops a couple of weeks ago! On the tail end of my time with the Chaska Area Quilt Guild, I was taken to Maple Grove to spend a few days with my mom and her two sisters, my aunts who are near and dear to my heart. Remember a year ago July when all three joined my Alaskan cruise? We had too much fun. So, here I am carting my suitcase down the stairs at Joy’s house, ready to move into her office space for a few nights, and low and behold –There is not just one, but TWO poor looking plastic machines sitting in front of the couch on the coffee table. “Can you make these work? ?” she pleaded. Quipped by Bonnie K. Hunter at 9:21 AM 14 Snips & Comments by others! All the Way to Wytheville! Wytheville, Virginia isn’t that far from the cabin in Mouth of Wilson – if you are a crow flying! However, if you are a van on the road, followed by a friend driving her car behind you and taking winding back roads you may as well slow down, enjoy the scenery and take it easy. The 58 miles is going to take you a while, but it’s worth the drive! Isn’t this the cutest downtown? I love driving through Wytheville, they’ve done a great job of keeping their main street stores in good condition. I love it when buildings are bustling and busy, not sitting forlorn and vacant. Quipped by Bonnie K. Hunter at 8:41 AM 15 Snips & Comments by others! Drawing for the August Quilty Box Winner! Someone is going to be ONE QUILTY BOX richer in just a few moments! Hi, everyone – I made it home from the cabin late this afternoon. Irene and I made a detour through Wytheville to hit Sew What Fabrics & Batiks Etc. as well as enjoy a fun lunch out at the 1776 Log House restaurant. Wytheville is an easy one hour drive from the cabin, all on scenic back roads and the views were wonderful! The shopping wasn’t too bad either, and I’ll be sharing that in tomorrow morning’s post. From Wytheville we went our separate ways: Irene heading north to Charleston, WV and on home from there to Louisville, and I went south on 77 –with another pit stop made in Fancy Gap for the first time stopping at the Pottery & Fabric Outlet. I needed more time! And that traffic heading NORTH? I was glad I was going the other way -- I-77 was a nightmare in that lane. Could it be all of the eclipse lookers headed home? But before I run away on that tangent, let’s get back to the fun at hand. Our AUGUST Quilty Box Gift-Away! And all of these other goodies too! This box was curated by SusanClaire Mayfield at GourmetQuilter.com! She has been quilting since the 1970s and was encouraged to sew as a child by her mom even before then. When asked to teach at a local quilting store, SusanClaire decided to prepare her own patterns for the class. The designs and patterns were popular and quilters asked for more – and so the pattern designing began. SusanClaire has many designs now and her own studio in New Zealand and loves it! With 4099 entries, the Random Number Generator went LOW! Congrats, Dora! This Quilty Box will be coming your way as soon as you get me your mailing address. I’ve sent you an email – just waiting for your reply. Thanks again for participating, everyone! And even more thanks to the folks at Quilty Box for providing these boxes for us to give to you. Be watching for our September box next month! I LOVE that 5% of the proceeds goes to Quilts for Kids! We get a happy Quilty Box in the mail, and the kids get more quilts to cover them with love. It's a win/win every way you look at it. I walked into my basement studio after nearly a week away to find that the floor was STILL covered with quilt blocks. Oh, yeah. String Snowball & Nine Patch quilt on the “Design Floor” from last Wednesday’s Quilt-Cam! I’ve got a lot of work to do at this computer, and the blocks are in the way of my desk chair, so I’m spending the evening just webbing the top together so I can sit at my desk tomorrow without rolling over blocks. Call the midwife was just finished – looking for something new to binge on. What’s in your Netflix queue?? Give me something good! Quipped by Bonnie K. Hunter at 9:22 PM 22 Snips & Comments by others! Outside on the deck for lunch at the time the eclipse was set to begin. It was a beautiful afternoon, but the sun was shining through fluffy banks of cloud cover and I just wasn’t sure we were going to get anything. Still, it was fun to watch a bit of TV reporting, and live website updating on just what was being seen around the country. Last night we watched the Weather Channel feed, and to hear how bad the traffic was as folks were crawling home from South Carolina and through Georgia made me glad to just be where I am stitching away with my friend, and celebrating what eclipse there was in Southwest Virginia from the comfort of my deck! Quipped by Bonnie K. Hunter at 8:41 AM 16 Snips & Comments by others! A Bit of Time Out! As quilters, no matter how much we love endless days of sewing, there is only so much time you can sit in front of a machine putting the pieces through before you’ve just got to get up and get a break. And break we did. About 4pm yesterday. There is not a lot of industry in Mouth of Wilson, Virginia – but we have a couple of conveniences that our place on Buck Mountain didn’t have – including the cutest General store on all of route 58! AND. They have a walk up ice cream window. And beautiful views along Big Wilson Creek. Quipped by Bonnie K. Hunter at 9:32 AM 18 Snips & Comments by others! And then one day….a bear just walks into the yard in broad daylight. We were not here at the time, we have a couple of trail cams set up to catch the deer, squirrels, raccoons and other critters that come through. We love seeing them. This guy was TOTALLY unsuspected! We had told there was ONE BEAR in the area – Barbara from down the lane and across the street had mentioned that one day she was just sitting on her front porch, and here he came…meandering up the road right in front of our mail boxes. We were shocked when we reviewed the photos from the trail cams to see this guy. There were several photos of him…..some of him just “hanging out” and dozing in the sun, or sitting there just looking around on his big ole bear bottom. Quipped by Bonnie K. Hunter at 9:08 AM 19 Snips & Comments by others! Just a Few Bumps on the Road! I love it when I travel up I-77 heading north and get my first glimpse of the Blue Ridge Mountains ahead of me. My heart smiles. My stress leaves. I’ve got plans for the weekend, a friend coming from Kentucky to cabin retreat with me and time to relax and stitch and chat and laugh and catch up. And I’m making good time – I did all of the grocery shopping after the post office run and then doubled back to get Sadie before leaving so she would not be left in a hot car. Quipped by Bonnie K. Hunter at 9:00 AM 24 Snips & Comments by others! So much to share – what a day yesterday was! But I think I’ll save “most” of that nitty gritty and jump right into THIS excitement because Irene and I have a bunch of sewing to do and time is wasting! The August Quilty Box was waiting for me upon my return home from Minnesota and I couldn’t be more thrilled with the goodies in side. Quipped by Bonnie K. Hunter at 9:06 AM 6 Snips & Comments by others! It was a last minute decision as I realized part way through the day that The Hubster would be away at tennis, and my to-do list was manageable enough that we could squeeze it in. And we had the perfect project at hand. Or perhaps I should say ON THE FLOOR. I’ve tried demonstrating quilt top “Webbing” by still photograph, but until you see it in action, it sometimes doesn’t make sense to folks. I’m a visual learner. I get it! So I got down on the design floor with my pieces and we did it via Facebook live on my Quiltville Facebook page! Abundant Chaska Show & Share! Several years ago, in 2011 I wrote during a past visit to Minnesota about where I went to elementary school through 2nd grade, where we lived when I was little, just walking down memory lane. Fast forward to the next summer and while I was doing a book signing during the quilt show at the park in Sister’s Oregon, I was approached by this lovely lady and asked a few questions! “When did you attend kindergarten at Groveland school?” She asked me inquisitively. I was born in 1962, so I would have been 5 in 1967, so I would have started kindergarten about then. “Do you remember who your kindergarten teacher was?” Ummmm…..I was 5. I don’t remember. Try as hard as I might, I don’t remember. It turns out that there were only 2 kindergarten teachers during the years that I was attending Groveland elementary school. And Lois was one of the teachers. She could have been mine! She could have been the teacher next door as well, but as the classes combined for group activities, it’s safe to say that she taught me when I was 5. Quipped by Bonnie K. Hunter at 9:53 AM 9 Snips & Comments by others! Just around the corner from Lou Ann’s Quilt Garden in Oelwein, Iowa is a beautiful memorial park honoring those who served in many wars from this area. Loretta and I gathered up our subway salads, and found a quiet place to sit and chat and eat at a picnic table placed not far away, beneath the shade of a large tree. Memorials like this are found in small towns scatted all around America, reminding us all of the sons and daughters who gave their all for so many who will never know them. Quipped by Bonnie K. Hunter at 10:05 AM 14 Snips & Comments by others! I walked in my front door after 11:30pm last night. I kept telling myself that I was still on Minnesota time, so my body clock was only registering 10:30, but travel is long, hard, exhausting and let’s face it – I’d been running at full tilt even while relaxing with family. I’m still laughing at the scenario at yesterday’s breakfast – eggs all around, who wants toast? And Uncle Steve accusing mom of sneaking yet another piece of strawberry rhubarb pie. “I was just straightening up the edges!” She confessed. Too funny. Stories before I came along. And then in 1962 I became part of the story too. Uncle Steve was reminiscing over how he used to baby sit me when I was little. Quipped by Bonnie K. Hunter at 9:20 AM 13 Snips & Comments by others! Boat Floatin’ Card Playing Fun! On my first trip up to Spicer, MN to spend a couple of days with my Uncle Steve and Aunt Kathryn! Unbeknownst to us, they had purchased us tickets for a 2 hour boat ride around Green Lake! This lake is sometimes also referred to as "Big Green Lake" because it is connected to Little Green Lake by a channel. Green Lake was named from the fact its waters are green from the high algae content. Quipped by Bonnie K. Hunter at 10:27 AM 8 Snips & Comments by others! We left my pup-cousin Waffles in the care of Uncle Scott as the Mach 5 commenced with loading vehicles and making all preparations necessary for a double-overnight excursion up to Spicer, MN to stay at the home of my uncle Steve, the other half of my aunt Kathryn. Oh, Waffles, you are such a kick! We walked Waffles around the yard to make sure all duties were done before loading up. Out of all 5 of us – I must be the only one not born with a green thumb. The gardens in this family really are a joy to behold. From Yard Sales to Rink Rats to Farmers Market! From left to right, in the back seat of my Auntie Joy's car with Auntie Kathryn, and my mom in the middle. The shortest one ALWAYS gets the hump for their feet. That's the rule. "We're going to be late!" She said. "We can't be late - everyone will be there by 10am." It's okay, mama - we'll get there. We are on our way. It only STARTS at 10am, and not everyone will be there just waiting for you to walk in the door at 10am! We were on our way to Caribou Coffee, a chosen destination for the 2017 reunion of the Bloomington Rink Rats - a group of roller skating kids who banded together in the 1950s for Friday and Saturday nights of safe fun, skating competition (all in good sport!) and exercise - but most of all, life-long friendship building. I'm sure at 15 years old (some younger, some older) they weren't aware of how much their friendships would mean to them over the coming decades, and I as a daughter had no real clue about how deep these devotions to each other ran, but I was soon to find out. But first - some YARD SALES! It's a Mach-Girls tradition any time we are together. Oh, the laugher and fun and thrill of the hunt. "Look! There's a sign! Let's stop!" "Got it!" And off we went. Quipped by Bonnie K. Hunter at 10:02 AM 12 Snips & Comments by others! We started our day off with a detour yesterday. Leaving the house with plenty of time to get from Minnetonka to Chaska, Kim wanted to know if I could find the house where I lived during the first few years of my elementary school years. I may not remember the name of all of the side streets and cross roads, but my heart knew the way. Turn past the swampy little pond on the right – the one covered with the lily pads. The one where I wanted to collect little snail shells. The one where I first found a salamander, and wanting to keep it safe as a pet, put it in my little purse, hid it in my closet and forgot about it – only to be discovered later by my mom as she searched to find out just WHERE that smell was coming from. Go further up the street. No, not that one, but I can tell we are getting closer. And there. That’s it. That’s the one. My house. “The BROWN house” as we have always referred to it as. For 50 years in my memory, it’s always been the BROWN house. Quipped by Bonnie K. Hunter at 9:26 AM 11 Snips & Comments by others! A Garden Party Day in Chaska! “I’m scared of such small pieces!” I often get when we are getting ready to sew. As long as you are sewing the SAME seam allowance, small pieces are not a problem! 1 1/2’’ strips are my FAVORITE size, and I love the many things we can do with them. Finishing at only 1”, the fabrics just SPARKLE! And if that fabric is fairly ugly, there is not that much of it showing so chances are you are only going to get a spot of color. The Chaska Community Center in Chaska, Minnesota was alive with quilter activity yesterday and will continue through tomorrow! Quipped by Bonnie K. Hunter at 8:42 AM 12 Snips & Comments by others! A Bit More String Spider Web! Me and the Pink Ladies who traveled in for our retreat in Oelwein, Iowa this past weekend! Such a fun bunch! They all were! 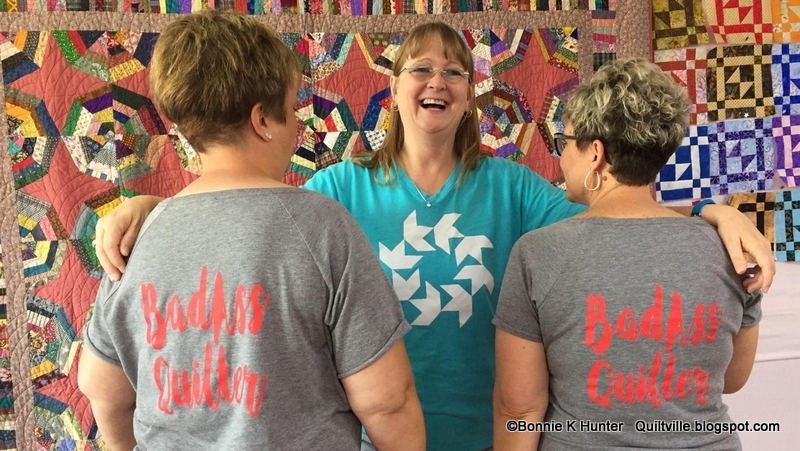 Oh, the groups with matching T-shirts – every day another round of Quilters Attire – so fun! It was a short day, but let me tell you, we crammed in as much activity as we could in a short 4 hours – let those strings fly! I shared yesterday the SIX BLACK 301s that came out to play. Quipped by Bonnie K. Hunter at 8:34 AM 7 Snips & Comments by others! Moth in the Window with Group 2! This is what you get when 59 quilters come from all over to retreat in Oelwein, Iowa! Our retreat was put together by Jo Kramer of Jo’s Country Junction and her daughter Kelli! We had our first retreat 2 years ago and it turns out the Iowa is a GREAT location as it is fairly central in the states and easily accessible from everywhere. Unless you are my box of rulers that I shipped on Monday that was supposed to arrive here by 3 day priority mail on Friday – and still hadn’t shown up as of yesterday. The post office is closed today – but I have followed my tracking number having text messages sent to my phone with every scanning. It sat in the black hole of Des Moines for more than 2 days saying “in transit” (to where!?) And finally last night I got a ping that it had reached OKLAHOMA CITY!!??!??!??! Quipped by Bonnie K. Hunter at 8:44 AM 7 Snips & Comments by others! String Spider Web in Oelwein! Check out these shirts! HA! There are close to 90 Bad@ss Quilters storming the streets of downtown Olewein this week and I’m happy to be amongst them! With a small town like this, having 27 retreaters at Lou Ann’s Quilt Garden and Retreat Center, and another 60 at the community center, sleeping in near by hotels, B&B’s, camping at campgrounds in the area, hitting up all of the shops and restaurants and everywhere in between – we are an economic force to be reckoned with! And if you add all of the folks from surrounding areas who came for last night’s double feature presentation with Julie Latvin of Me & My Stitches, and me sharing our quilts and stories, as well as a vendor’s mall for fabulous goodies - meant that there was a LOT of Quilt Traffic happening in North East Iowa. Many folks came from as far as two hours away, shop hopping and dining their way here. Yes, we are kind, giving, supportive, hard working and fun, but we are also, communitively….BAD@SS! Quipped by Bonnie K. Hunter at 9:08 AM 11 Snips & Comments by others! This was the beautiful just-past-sunset view of Cedar Rapids Iowa as I was landing on Wednesday evening. After a very quick connection in Detroit ( I had 10 minutes to run from the arrival gate to my next departure!) I was worried that luggage may not have made the connection, but I crossed my fingers the whole way. The worst that would happen? Things would come in the next morning and we’d have everything by noon. I could start a workshop without the class sample just based on the “test blocks” that several students make before they even come to class. And the truth of the matter is – I’ve only had to do this once, when I taught in Kenora in Canada and the bags got left in Minneapolis never making it to Winnipeg until the next day. We could do it if we had to. Quipped by Bonnie K. Hunter at 8:52 AM 12 Snips & Comments by others! As my flight arrived late last night in Cedar Rapids followed by a 2 hour drive to Oelwein, I planned ahead! Today you will find my post up on Meg Fahrenbach’s blog, My Tea & Brie. Meg has been running a “Scrappy Trips Summer Sew Along” this summer and while her crew have been making tons of Scrappy Trip-A-Long blocks over the past few months, Meg thought it would be fun to do a bit of “getting to know you better” behind the scenes. I’m happy to jump in! Perhaps there are things we talk about that you weren’t aware of before. So hop on over and check out our chatty interview. And poke around and see what else she has going on as well! She has many group projects on the go and you just might find something to tickle your fancy and get you motivated to make some progress on something. Find the Scrappy Trips tutorial HERE. Quipped by Bonnie K. Hunter at 8:12 AM 11 Snips & Comments by others! When Life Gives You a Bonus! Miss Emmy Lou Lou just watching on and shaking her head. She is always within eye-shot if not just ear-shot. She is also extremely conversational and will meow and meow at me like I should be able to completely understand every sound she makes. She calls me to bed when she’s had enough of watching me sew. She’ll go half way up the stairs, turn to me and beckon me with “Come on, already!” meows. She is the queen at 17. And yesterday she was my comforter as I waited for the outcome of my brother Mark’s surgery. Update: The shunt isn't draining as planned. He is still in the hospital and more surgery will happen tomorrow. Continued prayers are more than welcome. Thank you. Quipped by Bonnie K. Hunter at 9:48 AM 28 Snips & Comments by others! My hands are staying busy. I don’t know if you do the same thing, but when my heart and mind are conflicted, burdened, frightened, sad, or trying to make sense of things, I have to be busy. Sit quietly and contemplate and meditate? Impossible. You know the scene from “Eat, Pray Love” where Julia Roberts is trying so hard to meditate and her thoughts go through a million things, only to wind up peeking at the clock to see that only a minute has passed. Yep. That’s how it is here with me. And that’s why some people go for a run, some cook, some dance, or sing, or take long showers. We each deal with things we can’t control in our own way. My hands are busy so my heart can be still. My creativity takes over so my mind can pray. Quipped by Bonnie K. Hunter at 8:34 AM 55 Snips & Comments by others!